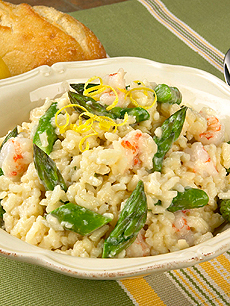 Classic risotto gets a tasty new treatment with fresh asparagus spears and rock shrimp. Photo courtesy California Asparagus Commission. Risotto is such a delicious food—but it’s so beige. Add color, crunch, flavor and visual interest with fresh asparagus. This is Page 8 of a 12-page article. Jump to the recipe below. Click the black links below to view the other pages. Bring chicken broth to a simmer; keep hot over lowest heat possible. In a large, heavy-bottomed saucepan, cook onion with butter, oil, and salt over medium-high heat until soft, about 5 minutes. About 5 minutes before risotto is done, stir in asparagus and shrimp. Continue cooking until shrimp is pink and just firm. Add a bit more stock, if necessary, to achieve a creamy but not soupy consistency. Serve on warmed plates, and season with freshly ground black pepper to taste.